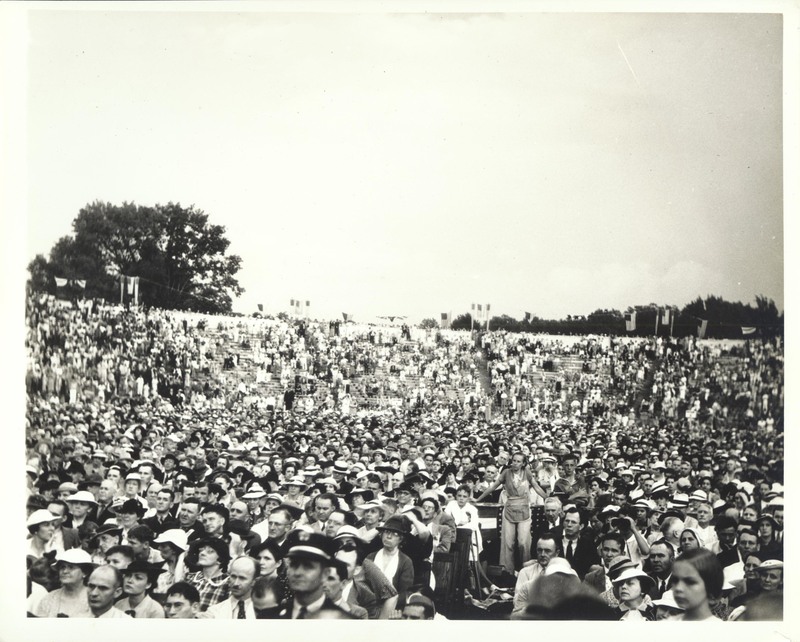 American Legion Memorial Stadium (1936) was a direct result of substantial Federal assistance to local government and was the first municipal structure in Charlotte that could accommodate thousands of visitors. From the outset it became a venue for sporting, entertainment and civic events that would have been impossible to hold. 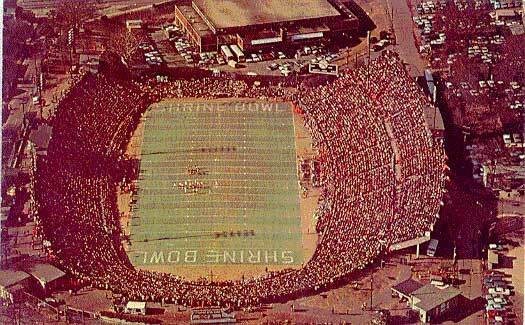 Over the years, a broad array of happenings have occurred at Memorial Stadium, most notably football games – high school, collegiate and, from 1937 through 2000, the Shrine Bowl. Memorial Stadium also has hosted July 4 th concerts, professional wrestling matches and performances by entertainers such as Pearl Jam and Jimmy Buffett. 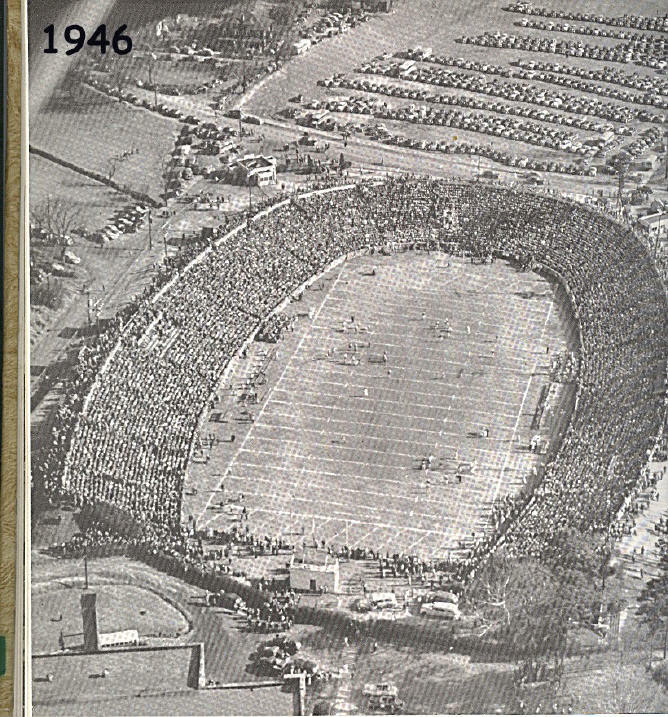 This photograph of American Legion Memorial Stadium appeared in the 1947 Central High School Annual. You are looking east. Note that Independence Boulevard had not yet been built. Spectator sports, both amateur and professional, rose in popularity in the 1920s and 1930s largely because of an increase in middle class income, greater availability of automobiles and the growth of urban centers. Charlotte’s population burgeoned in the early 1900s, from 18,091 in 1900 to 134,052 in 1950. The need for a facility such as the American Legion Memorial Stadium was clearly becoming increasingly defensible. Indeed, a major expansion of the stadium took place in the 1960s and 1970s, when upper level seating was added first on the north side and then on the south side of the playing field. The stadium bore dramatic testimony to a shift in attitudes in the 1930s about the role of the Federal government in societal affairs. The construction of American Legion Memorial Stadium in Charlotte was intimately bound up with the relief programs of the Great Depression. President Franklin D. Roosevelt persuaded the U.S. Congress to create the Works Progress Administration (W.P.A.) in April 1935, with an initial appropriation of $4.88 billion to provide jobs for millions of unemployed laborers, artists, writers, scholars and others. The W.P.A. provided most of the funding to construct an assortment of structures, including airports, seaports, bridges, schools, museums and stadiums. The W.P.A. also supported programs in the humanities, including the Federal Arts Project, Federal Writers Project, Federal Theatre Project, National Health Survey and the Historical Records Survey. Charlotte leaders, including Mayor Arthur E. Wearn, were eager to benefit from the dollars provided by the Works Progress Administration. Wearn, who had become mayor by appointment on May 3, 1933, had already secured $70,000 of Federal funds from the Federal Emergency Relief Administration (F.E.R.A.) and the Civil Works Administration (C.W.A.) on January 3, 1934, to enable the City to begin work on a stadium in Independence Park. There was considerable public opposition to the City's accepting the money to start the Stadium. One property owner was particularly outspoken. "I am a lover of beauty," he began. "I object to having a beautiful 30 or 40 trees cut down, a beautiful natural amphitheater turned into a concrete bowl surrounded by a high fence -- to say nothing of the attendant noise and dust." Strong political support for Mayor Wearn’s efforts to build a major outdoor sports facility in Charlotte had come from the Hornet’s Nest Post Number 9 of the American Legion. That patriotic organization wanted the stadium to serve as a memorial to those soldiers from Mecklenburg County who had served the United States during The Great War, now called World War I. The City Council agreed on June 13, 1934, to name the facility "American Legion Memorial Stadium." The Stadium As It Appeared In December, 1935. Notice that there are no seats. Earth had been moved by December 1935 to create a playing field that was bordered by a rock wall and that was surrounded on three sides by grass embankments. However, enough money to install seats was not initially available. This meant that the Stadium was essentially unusable. Soon after the House of Representatives gave its assent to the creation of the W.P.A. in January 1935, City officials provided a tentative list of the projects they planned to submit to the new agency if it was approved by the U.S. Senate. These included an array of undertakings, such as street improvements and even placing public restrooms below ground at the intersection of Trade St. and Tryon St., locally known as the Square. 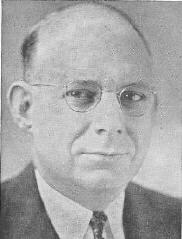 The impetus for new construction projects in Charlotte increased substantially when Ben Douglas defeated Arthur Wearn by popular election and became Mayor in May 1935. A native of Iredell County, Douglas had moved to Charlotte from Gastonia in the mid-1920s and had established a funeral home at the corner of Fox St. and Elizabeth Ave., now Independence and Elizabeth. 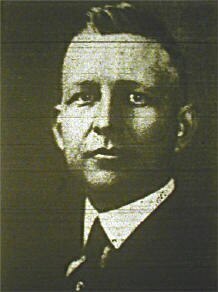 A tireless and adroit politician, Douglas was Mayor from 1935 until 1941, and earned the reputation of being the "Builder of Modern Day Charlotte." Douglas loved the drama and passion of the political arena and devoted his enormous energies and talents to leading the people into what he hoped was a bright and prosperous future. 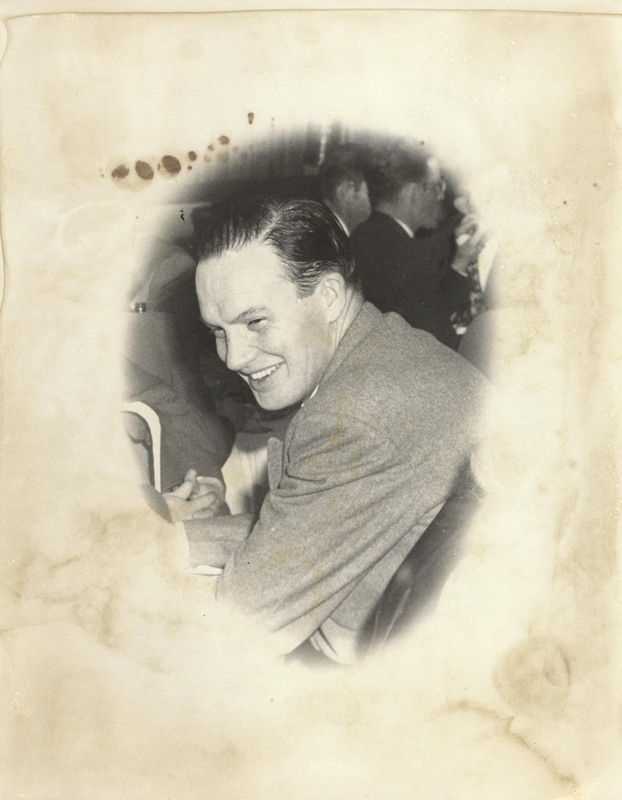 Born in the 1890s, he reached adulthood during the "roaring twenties," when it seemed that everybody was making piles of money in the stock market. Then came the crippling Great Depression of the 1930s. Douglas saw himself as a cheerleader, as an urban booster, who would rally the people of Charlotte and give them hope. Douglas hired James B. Marshall as City Manager. A native of Anderson, SC, Marshall was a brilliant engineer who had graduated from the College of Charleston before settling in Charlotte in the 1920s. By the end of May 1935, Marshall was busily at work preparing a list of projects for submission to the W.P.A. for possible funding. The W.P.A. had a major presence in Charlotte. A district office of the W.P.A. was established on Tryon St. in July 1935. John Grice, its Director, urged Charlotte-Mecklenburg officials and those in surrounding counties to submit applications for projects. 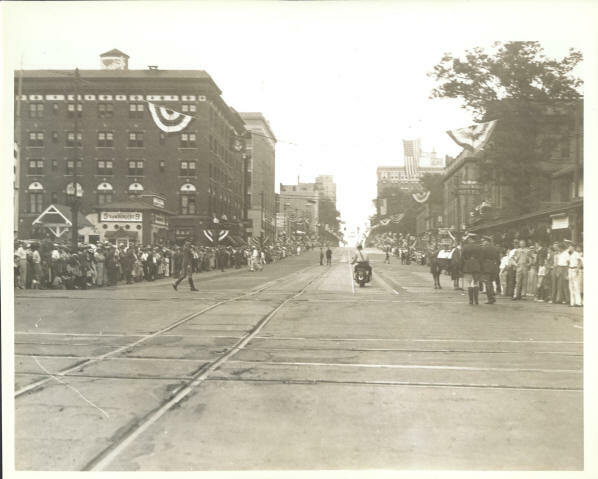 On August 28, 1935, local attorney Marvin Ritch appeared before the City Council and urged that "some immediate action" be taken "toward completing the stadium in Independence Park." Not surprisingly, Marshall included the completion of Charlotte’s stadium on his list of W.P.A. applications. The largest project for which the City sought W.P.A. funding was the creation of a municipal airport. This is the Armory Auditorium which stood just west of the stadium. If you look carefully you can see part of the natural area that once occupied the space behind the building. The Charlotte Observer reported on November 7, 1935, that the City would be submitting its formal application to the W.P.A. for the Stadium. 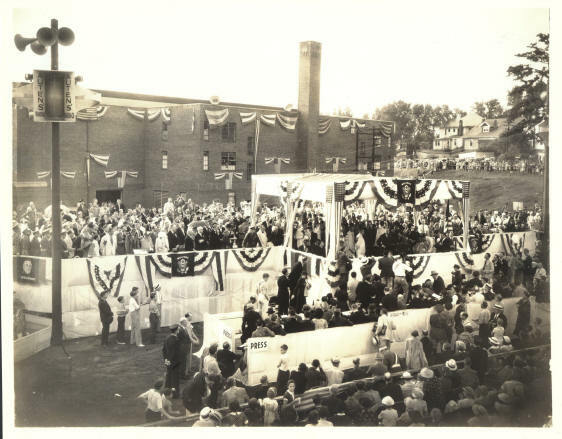 George W. Coan, Jr., State Administrator of the W.P.A., informed Mayor Douglas and City Manager Marshall on December 27, 1935, that funding for finishing the Stadium had been approved. “Completion of the Stadium will give Charlotte one of the finest bowls in North Carolina,” stated the newspaper. Mayor Douglas greeted the news with his usual enthusiasm. “It will put a lot of people to work,” he said. “I am mighty glad to hear that it is going through.” City Manager Marshall announced, “Our plans are ready and we ought to get started on it right away.” The Charlotte Observer commented editorially on the project the next day. “Gratifying the information that the completion of the local stadium through the medium of Federal funds is to be undertaken at once,” the newspaper proclaimed. This picture of newly-elected Mayor Douglas and the Charlotte City Council appeared in the Charlotte Observer in May 1935. Seated left to right on the front row are Claude L. Albea, W. N. Hovis, Mayor Ben E. Douglas, L. R. Sides, and John F. Boyd. Standing left to right on the back row are J. S. Nance, Herbert H. Baxter, J. H. Huntley, Mayor Pro-Tem John L. Wilkinson, J. S. Tipton, W. Roy Hudson, and John F. Durham. George Coan, Jr. left to local officials the decision as to whether the stands would be constructed of concrete or native stone. Stone, which had been used in the recently completed wall at the edge of the playing field, would have been more aesthetically appropriate; but the City selected concrete as the building material for the stands, primarily because the installation of stone would have required a pool of skilled labor that was not locally available. The W.P.A. awarded $51,617 for the stadium project, and the total City contribution was less than $5,000. Workers came to the site in early January 1936, and work continued during the next eight months. The need to complete the stadium intensified after June 22, when word arrived that President Roosevelt would be visiting Charlotte on September 10 and would be making a major public address at American Legion Memorial Stadium. According to the Charlotte Observer, the President would be participating in an “old-time Democratic love-feast,” labeled a Green Pastures Rally, to which the party faithful of seven states would be invited. On July 11, John Grice stated that the concrete stands would be finished soon and that installation of the seats would commence shortly thereafter. “The stadium positively will be completed by September 1,” Grice promised. 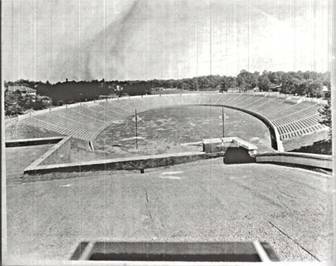 The newspaper reported on August 25 that the seats were being installed, and the Charlotte Observer published a photograph of the completed stadium on September 1, 1936. The editors of the Charlotte Observer understood the role of the Federal government in making American Legion Memorial Stadium possible. It was altogether fitting and proper that President Roosevelt was the first speaker at American Legion Memorial Stadium. The Chairman of the Green Pastures Rally of September 10, 1936, was Charlotte attorney Haywood Robbins. He and his colleagues worked diligently to assure that the event would be successful. President Roosevelt arrived by motorcade from Asheville, NC in the early afternoon of September 10 in a heavy rainstorm and traveled directly to American Legion Memorial Stadium. From a platform erected at the western end of the stadium, just behind the Armory Auditorium, the President gave a rousing address to an enthusiastic throng of well wishers. Even though he professed to be making a nonpartisan speech, Roosevelt insisted that the nation would only prosper if the common man fared well. The first of many college football games in American Legion Memorial Stadium occurred in the afternoon of September 26, 1936. 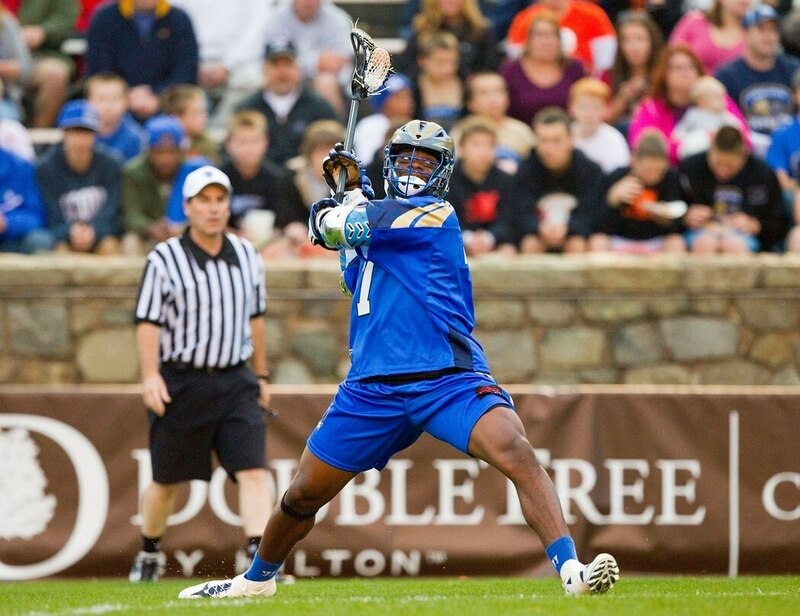 The University of North Carolina and Wake Forest College played. According to the Charlotte Observer, it was “by far the largest (crowd) ever to see a football game in Charlotte.” U.N.C. won by a score of 14 to 7. Dedication ceremonies for the Stadium were held before the game. American Legion Memorial Stadium has continued to occupy an important place in the cultural life of the community, especially as a host for high school football games. The completion of Bank of America Stadium in the 1990s, however, meant that Memorial Stadium was no longer the largest outdoor sports facility in Charlotte. Also, high schools have acquired their own football stadiums. Inevitably, the level of civic commitment to the site has began to wane. Its illustrious history notwithstanding, the stadium is now often overlooked. 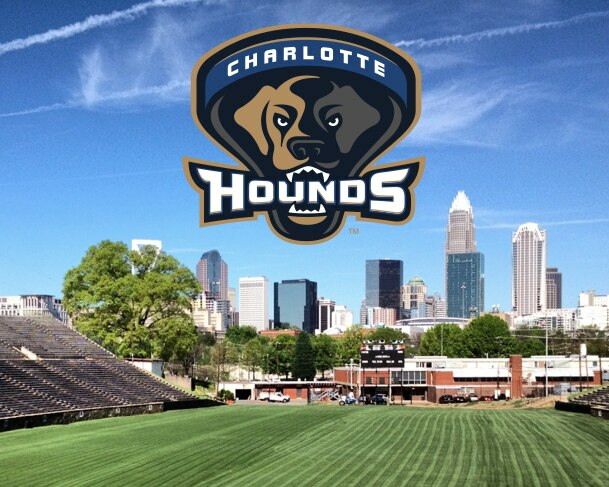 The Hounds are proud to call this historic venue "Home," and hope to be a catalyst to its revitalization and future.